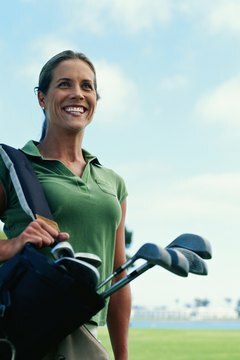 Women have unique needs when choosing golf clubs. Women's golf clubs, often called ladies' clubs, are lighter and shorter than the sets made for men. But not all sets are suitable, and a good set can make a tremendous difference in your game. Identify the features that are key to a good game for you before buying your set. Know your height. It may seem elemental, but it's worth having your height checked prior to buying a set of clubs. Women's heights can change with age and you may be surprised by your current measurement. Ladies' clubs are generally made to fit women between 5 foot, 2 inches and 5 foot, 9 inches. Measure the height of your wrist to the floor when in a golf stance. While your overall height helps determine the general shaft length that best fits, this measurement can fine tune the club to a better length for you. Remember that most women tend to play with clubs that are too long, so make sure you measure your golf stance to get clubs with shafts that are appropriate to not just your height, but also your proportion. Evaluate your swing speed. A pro shop or golf equipment store can help you by videotaping and providing a picture of your average swing. Women with slower swing speeds need to replace their irons with a club that has a hybrid construction, such as graphite. The lightness of the graphite will enable a speedier and stronger swing. Replace your irons with utility woods. Because of their height, many women find a 7- or 9- wood to be a more comfortable club to use rather than a 3- or 4- iron. Truly dedicated female golfers often include a variety of woods (3- and 5- wood in addition to the 7- and 9- wood) as well as a few irons. Look closely at your putter; it's one of your most required clubs. A standard women's putter is 33 inches. This length is manufactured for women 5 foot, 5 inches. If you're taller or shorter than that, test a number of putters and find one that feels best. Evaluate wedges. You'll need a sand wedge and lob wedge to use if you're stuck in a sand trap or out in the rough. Most novice women's clubs do not include a gap wedge, but you may need one if there is a large difference in distance between your sand wedge and lob web shots. Go to a custom fitter. Since most ladies' clubs are built for only a general slice of the population, you'll find an investment in a fitter to be worth it. A custom fitter creates clubs that take into consideration your unique size and skill level. However, since it's not an inconsiderable sum, make sure you have at least a year's experience so that your game is reasonably consistent before you head to a custom fitter. What Are 18- and 20-Degree Hybrids? What Are Hybrid Golf Clubs?